Following are policies set by SPN. These policies serve as explanations to our readership on why we do certain things (eg remove comments containing foul language), and they serve as our promise to you (eg, we will always obtain permission before printing a post obtained from a private group on Facebook). It will also serve to explain what posts we embed from the public realm, and why. This is a living document, meaning that it can be updated and improved at any time. See the Terms of Reference for Subscribers. 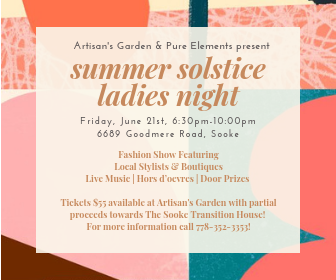 Please keep these things in mind as you choose to engage with Sooke PocketNews. Comments that do not adhere to the stated policy components will be removed. Remember to challenge the point of view, not the person. Keep comments focused on the issue at hand. While you can challenge other peoples’ views, we request that you do not attack other people for posting their views. Those that continue to violate our comments policy may be blocked and/or disabled from commenting further. Let’s do our best to show respect while allowing for a healthy exchange of informed facts and points of view. We do not lift any posts from a private group. If there is something we think would be of interest to the SPN readership, SPN will contact the owner of the post and request permission (and a No is always respected). We will also always give credit to the group from where the information was obtained. This is to help the group grow their membership. If it’s posted with public permissions, available to all (ie, common Twitter posts), we embed them, using the embed code provided by the social media source (eg, Twitter or Facebook, Youtube, CBC, CTVNews, etc). Where feasible, we attempt to contact the content owner, but given that they have posted a comment in the public domain, we may publish the item in question even if individual permission has not be obtained. This is only when the permissions are already set at public. We honour requests to not publish something on SPN, even though it’s been published in the public domain. Ultimate ownership of embedded posts always belongs with the owner, as they can change the permissions or remove the post—in both cases, they will no longer be visible on SPN. We also post things from public service groups, like Sooke’s Search and Rescue, the Fire department, and the RCMP. With some groups, like Meanwhile in Sooke, we have standing agreements. When you post via Facebook, your username will be attached to your post. When you post directly on the SPN News site, you have the OPTION of leaving your real name. You are, however, required to provide an email address. SPN reserves the right to remove posts that don’t have either a Facebook account attached to it or a real email address. We will remove photographs on request. If your photo appears in SPN from some public event (in which case, any media can take and public photos), we will remove it if requested. On occasion (eg, RCMP “wanted” reports), SPN will insert a “.” in a person’s name (eg, Br.itt Sant.owski) . When someone is wanted for and/or charged with a crime and named in an article, and then later exonerated, having their names searchable on the internet can damage their ability to get a job or rent a place or…. On two occasions, SPN has been contacted by people saying “That article is ruining my life, can you remove it?” So, we seek to balance the public’s right to know and an individual’s right to privacy. Putting a “.” in the middle of a name means it won’t turn up in a search by a possible future employer. The only lives we scrutinize are those of our public officials (elected and hired), and then only in their public capacity. What they do in private is not our concern. While we will publish proven events (eg, court outcomes, legal results) and while we will publish things a person might say about themselves, we will not publish opinions one person might have of another. Everything published on SPN is based on cost recovery. Costs that we bear include web hosting, a stand-alone server, software, administration, supplies, computer equipment, transportation, camera and videography equipment, and of course human effort. Individual members ($10/mo) have unlimited reading access, and when a member submits a personal letter-to-the-editor they can choose if it’s published behind or beyond the paywall. Because members pay to receive content, we welcome articles and press releases for publication behind the paywall, at no charge to the organization. Non-profit members ($20/mo) can assign up to two membership accounts, and when they submit a press release it can be published behind or beyond the paywall. A non-profit can be considered an SPN member if they have at least two individual volunteers and/or employees subscribing to SPN. We would need to know who they are, so we can attach them to the non-profit access. Corporations have a similar plan available, but with more member signup allowed, and more costly ($50/mo). Also, the emails attached to corporate plans must belong to the corporation, not the individual. To publish anything beyond the paywall without a membership, it’s a one-time fee of $50. To sign up for membership, click here. Currently, there are two categorical exceptions that do not go behind the Paywall. Indigenous news appears both behind and beyond the paywall, always. This is SPN’s small but hopefully meaning contribution to reconciliation. Student contributions appear both behind and beyond the paywall, so that they can have an accessible online portfolio as they build their careers. Fundraiser requests are limited to subscribers. We do not ask for proof of terminal illness or proof of “legitimate” need. Donors are responsible for doing their own research prior to donating. We do not “recommend” any fundraiser. We do not prefer one fundraiser over another. We reserve the right not to publish anything, including fundraisers. We leave it to the individuals to determine if they want to do further research and/or donate. Readers should practice caution, do their own research, and donate to fundraisers that they feel comfortable with. Our official view on fundraisers is available here. We publish a lot, but not everything. We will give you an explanation of why we opted not to publish something, if asked. Where generic images are used, they are always images identified as labeled for reuse. Creative Commons licensing information and links location are in the Description section (and sometimes the “alt” section) of the images. If you subscribe to SPN, in any capacity, your information will only be used in the capacity for which you have given permission. We do not and will not sell our subscriber lists. Ever. All newsletters come with an Unsubscribe option at the bottom of the email. You can also contact us directly and ask to cancel your subscription. Any questions or concerns about social media, your privacy, and SPN policies, please contact me and ask! I will always answer. Occasionally, we miss something or make our own mistakes. Feedback from the readership is always appreciated. 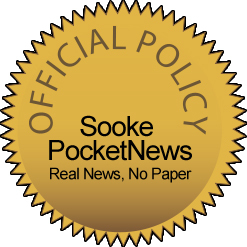 Email your comments to publisher@sooke.pocketnews.ca or just leave us a message or comment. Thank you, as always, for your continued readership. You are at the centre of our existence.